In this post in the RStudio:addins series we will try to make our work more efficient with an addin for better inspection of objects, functions and files within RStudio. RStudio already has a very useful View function and a Go To Function / File feature with F2 as the default keyboard shortcut and yes, I know I promised automatic generation of @importFrom roxygen tags in the previous post, unfortunately we will have to wait a bit longer for that one but I believe this one more than makes up for it in usefulness. The addin we will create in this article will let us use RStudio to View and inspect a wide range of objects, functions and files with 1 keypress. As a first step, we need to be able to retrieve the value of the object we are looking for based on a character string from a frame within the currently present sys.frames() for our session. This may get tricky, as it is not sufficient to only look at parent frames, because we may easily have multiple sets of “parallel” call stacks, especially when executing addins. viewing elements of lists, vectors, etc. where we need to evaluate [, [[ or $ to do so. If the View fails, we can still show useful information by trying to View its structure, enabling us to inspect objects that cannot be coerced to a data.frame and therefore would fail to be viewed. 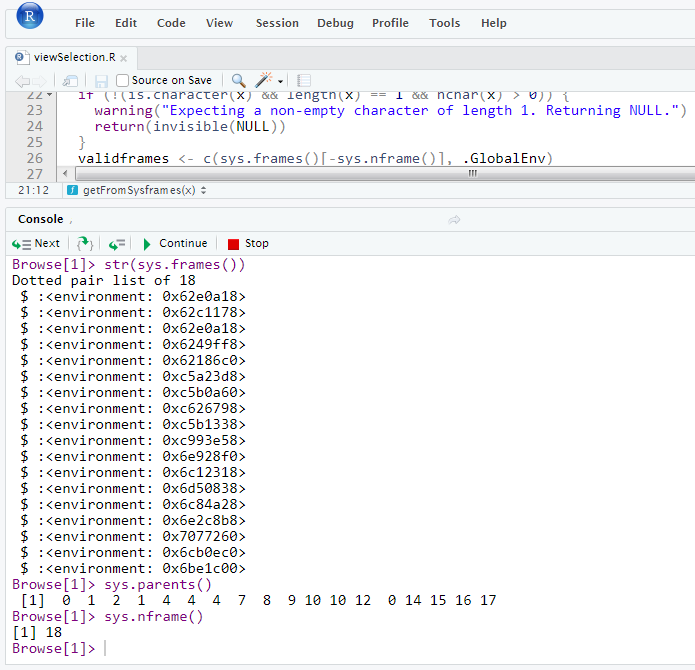 This function can of course be improved and updated in many ways, for example using the summary method instead of str for selected object classes, or showing contents of .csv (or other data) files already read into a data.frame. Now, let’s view a few files, a data.frame, a function and a try-error class object just pressing F4.